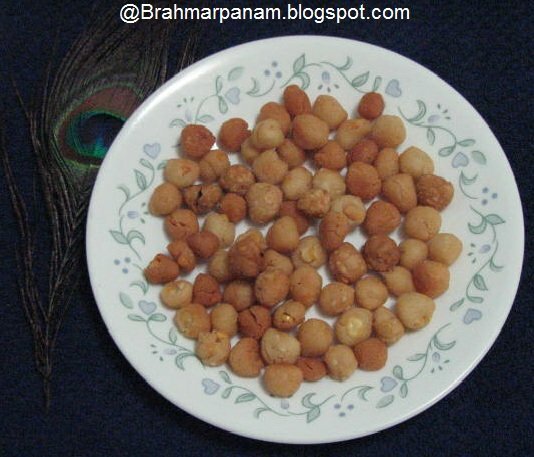 This is a tasty south indian snack generally made for Krishna Jayanthi. Extreme care has to be taken about the cleanliness of the ingredients and the place made, as this cheedai is very well known for bursting in the oil at the slightest impurity. Soak the Channa dal and Moong dal for an hour. Sieve and dry roast the Rice flour and Urad dal flour. (Frying gives less chance of the cheedai bursting in oil.) Mix the roasted flours along with salt, asafoetida, sesame seeds, soaked dals and butter. Add water little by little to make it into a soft but firm dough. Make very small balls of the dough and spread them on a clean cloth or newspaper. The cheedai balls should NOT be rolled tight and smooth but rolled loosely with cracks by using only the fingers. If it is rolled into tight smooth balls, then chances of it bursting in oil is very high. Also the balls should be very small and almost the same size as only then they will get cooked even and crisp. You can use coconut oil to rub on your hands so that the dough will not be too dry or sticky and it would be easy to roll out the small balls. Also it adds a nice flavor to the Cheedai. Once you have rolled out all the Cheedai balls, heat oil in a kadai/ wok. To test the oil add a pinch of the dough and it should sizzle up immediately. Now fry the Cheedai on medium heat and in small batches. Once done, cool them and store in an air tight container. If the oil is too hot the cheedai will not get cooked inside and if it is not the right temperature it will be soggy and not so crunchy. So make sure the oil is of the medium heat. It is advisable to stay away from the stove after dropping the cheedai balls in the oil so that atleast you wouldnt be hurt if the cheedai decides to burst!